An open, free for all session, as opposed to taking turns. 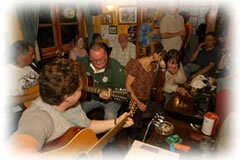 Formally held in the Coach & Horses, this bluegrass session has now moved to the Cross Keys (July 2004). Run by Bill McKinnon who makes sure everyone has a turn! Always packed, so get there early if you want a seat.